Consolidation and globalization in the food industry allow powerful retail brands to leverage their volume purchasing power and benefit from low prices. This creates downward pressure on farmers’ incomes and, ultimately, on farmworkers’ wages and working conditions. 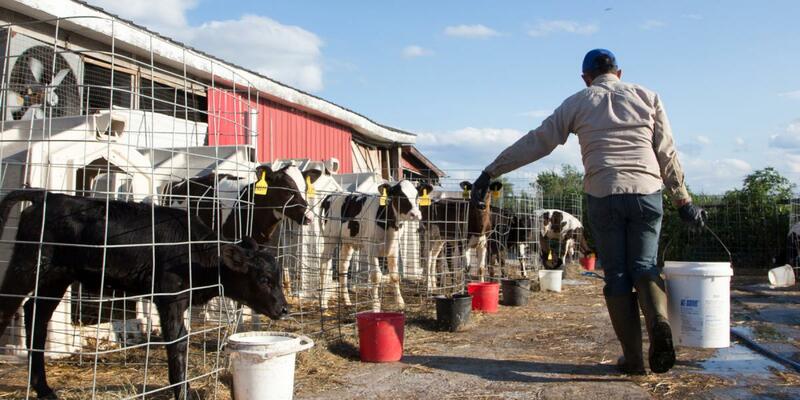 After significant immigrant rights victories and building upon years of working to improve labor and housing conditions on a farm-by-farm basis, Vermont dairy workers’ search for an effective systemic change led them to Florida. A series of farmworker-to-farmworker exchanges with the Coalition of Immokalee Workers (CIW) opened Vermont workers’ eyes to the transformative power of the Worker Driven Social Responsibility (WSR) model that fuels the CIW’s highly acclaimed Fair Food Program (FFP). Migrant Justice’s in-depth collaborative process with the CIW and FFP helped inspire and inform the creation of the Milk with Dignity (MD) Program. In October of 2017, after years of negotiations and campaigning, Migrant Justice and Ben & Jerry's signed an historic agreement making Ben & Jerry's the first major dairy corporation to join the MD Program and require its supplier farms to come into compliance with the MD Code of Conduct. The Milk with Dignity program is now fully operational in Ben & Jerry's northeast dairy supply chain, covering 100% of the company's dairy volume. The program will not end with Ben & Jerry's. Migrant Justice has already begun exploratory discussions with several other major dairy brands, and farmworkers are gearing up to expand the Milk with Dignity Program to secure the rights of thousands more dairy workers. As workers declared when signing the agreement with Ben & Jerry's, Milk with Dignity is bringing about "a new day in dairy; a new day for human rights." Food retailers can no longer turn a blind eye to the sub-standard labor conditions in their supply chains. The MD Program enlists the resources of participating food industry leaders, who commit to source their milk in compliance with the fundamental human rights of dairy workers, to improve farm labor conditions and help offset farmer’s costs of compliance by providing farmers premium prices for milk. Toward that end, the Program includes several crucial components for effective, sustainable farm labor reform, including: price premium payments by retail buyers to Participating Farmers to increase wages and improve labor and housing conditions, market consequences for dairy farmers that commit 0 tolerance human rights violations of the MD Code of Conduct, and supply chain transparency and accountability. The Milk with Dignity Program brings together farmworkers, farmers, buyers and consumers to secure dignified working conditions in dairy supply chains. The Program enlists the resources of food industry leaders to provide a premium for milk to participating farmers who agree to work towards compliance with the labor standards in the Milk with Dignity Code of Conduct. The premium helps offset farms’ costs of compliance with the Code and rewards farms that comply. 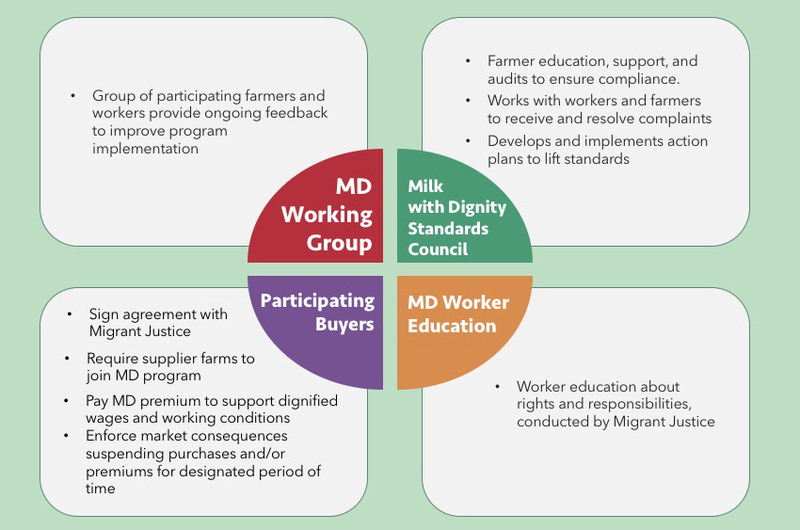 In the MD Program, compliance on the farm is achieved through a unique partnership and problem-solving approach among farmers, farmworkers, and the Milk with Dignity Standards Council (MDSC). The MDSC is an independent non-profit whose sole function is to work with farmers and farmworkers to understand, participate in, and achieve compliance with labor standards in the Code. Operationally, the MD Program is rooted in the MD Code of Conduct. The Code is created by the very workers whose rights it is intended to protect and is further improved on through an intensive feedback loop from participating farmworkers and farmers in the MD Working Group. The Code sets standards for working conditions relating to wages, health and safety, housing, schedule and rest, non-retaliation, non-discrimination, and other labor conditions. The MD Program is designed to encourage and support farmer compliance seeking to build participatory, fair, and dignified workplaces characterized by mutual respect, improved communication and collaborative problem solving. In the Milk with Dignity Program, compliance on the ground is achieved through a unique partnership among farmers, farmworkers, and the Milk with Dignity Standards Council (MDSC). The MDSC is an independent non-profit organization whose sole function is oversight of the program. The MDSC was created in collaboration with, and modeled after, the highly acclaimed Fair Food Standards Council (FFSC), which administers the CIW’s Fair Food Program (FFP), called “the best work-place monitoring program” by the New York Times. Enforce market consequences — e.g., suspend purchases and/or premiums for designated period of time. MDSC’s access to their workforce to investigate complaints, conduct Code compliance audits, and monitor implementation of corrective action plans (CAPs). Reviewing relevant supply chain records to ensure Participating Buyers pay Program Premiums only to farmers in good standing in the Program, thereby upholding market incentives that drive farmer compliance. The Milk with Dignity Program was created by Migrant Justice, a nonprofit, farmworker-driven human rights organization based in Burlington, Vermont. Migrant Justice educates workers as to their rights and mechanisms for redress under the Program. These educational efforts, together with the Program’s complaint process, empower workers to serve as round-the-clock, frontline defenders of their own human rights. Migrant Justice also coordinates a Working Group of Participating Farmers and farmworkers to provide feedback on the implementation of the program, negotiates with prospective Participating Buyers, and manages relations with existing Participating Buyers.